Kynan Chenai gave himself an advance birthday gift by securing a quota place for the Rio Olympics in the Men’s Trap at the Asia Olympic Qualification for Shooting in New Delhi. The 26-year-old Kynan registered the best day of his career when he battled all odds to finish fourth and grab one of the four quotas on offer in this event. Kynan’s birthday is tomorrow. He qualified in the top six after shooting a qualification score of 120 (47/50 yesterday and 73/75 today). In the final rounds, Kynan tied with three others after the first 15 shots with a score of 12 to reach the semi-finals stage, thereby assuring the 10th quota for India from shooting. In the bronze medal shoot-off with Kuwait’s Talal Al-Rashidi, competing as an International Shooting Participant (IPS) since his country is under IOC suspension for government interference, Kynan missed two of his 15 shots to his opponent’s one. Another Independent Shooting Participant Abdulrahman Al Faihan won the gold medal in men’s trap and Chinese Taipei’s Yang Kun-Pi bagged the silver. The other three quotas in the event went to Kuwait, Chinese Taipei and Kazakhstan respectively. Earlier in the day, 2012 London Olympic silver medallist Vijay Kumar’s hopes of earning a berth went up in smoke after having qualified for the finals with a top qualification score of 576 (285/300 yesterday and 291/300 today) the qualification round. In the six-man final where he had to beat Qatari Oleg Engachev and one out of two Japanese shooters to ensure a quota, Vijay became the second shooter to be eliminated finishing fifth as a result. “It was hard luck and I could only manage 1 hit in one of the final rounds, and that did not help my cause. My preparation was on the right track and I was having no problem with my shoulder and neck. They are fine. It happens in sport, it was not my day,” Vijay, who made the country proud by winning an Olympic silver medal in his pet event, said. He had a word of advice for compatriot Gurpreet Singh, who has already secured a quota and is likely to represent India in the same event at Rio. Vijay was disappointed with the result, but looked ahead to the future with hopes. The two quotas in the event were bagged by gold medallist Teruyoshi Akiyama and bronze winner Eita Mori of Japan. Korea’s Yong Hoo Choi clinched the silver. Korea could not claim quotas in this event as they had already exhausted their share in earlier competitions. 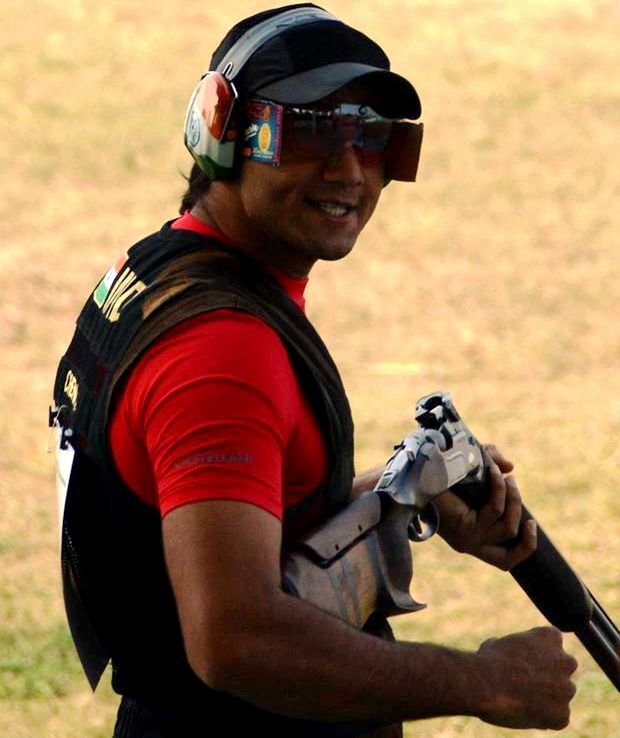 Former world champion Manavjit Sandhu also missed the trap finals by a point after shooting 118/125. Kynan was delighted with the result, though he could not finish on the podium. “This is the biggest achievement of my shooting career. Now, winning a medal in Olympics will depend on my training and work on my physical and mental aspects,” Kynan said after the event. Kynan gave credit to his senior Manavjit for helping him out with useful tips and acknowledged the efforts of his parents. Kynan’s father Darius Chenai had last month won the gold medal in the same event at the National Championship in Jaipur. Another Indian participant in men’s trap, Prithviraj Tondaiman also failed to make the final cut. Kynan’s was India’s second quota from the competition after Heena Sidhu won gold on day one in the women’s 10m air pistol. Men’s Trap: 1. Abdulrahman Al Faihan (ISP) 14 (12)3 (122); 2. Kun-Pi Yang (Tpe) 13 (12)3 (119)1; 3. Talal Alrashidi (ISP) 14 (12)2 (121); 4. Kynan Chenai 13 (12)2 (120); 5. Andrey Mogilevskiy (Kaz) 11 (119)1; 6. Maxim Kolomoyets (Kaz) 11 (120); 9. Manavjit Singh Sandhu 118; 10. Prithviraj Tondaiman 117; MQS: Zoravar Singh Sandhu 120; Anwer Sultan 118. Men’s 25m Rapid Fire Pistol: 1. Teruyoshi Akiyama (JPN) 28 (575); 2. Choi Yong Hoo (Kor) 25 (575); 3. Eita Mori (Jpn) 20 (575); 4. Oleg Engachev (Qat) 16 (571); 5. Vijay Kumar 14 (576); 6. Lee Young Hoon (Kor) 12 (571). MQS: Gurpreet Singh 581; Akshay Suhas Ashtaputre 564.